While we humans prepare for the winter holiday festivities, our puppies watch and wait for their chance to join in on the fun. It’s true that many of our holiday treats and activities aren’t safe for our furry friends, but that doesn’t mean we can’t spoil them. For this year’s winter holidays, put your fur-baby first in your list of gift-giving and take a look at some easy ways to spoil them for the holidays. Baking a delicious homemade treat for your pup is easier than you might think. Besides giving you control over what ingredients go into the treat, a homemade puppy treat also allows you to use your creativity, especially with the variety of holiday-themed materials available. If you’re not into baking, you can also take your puppy to a dog-friendly bakery and order a yummy puppy treat. We love a puppy’s happy and energetic spirit! 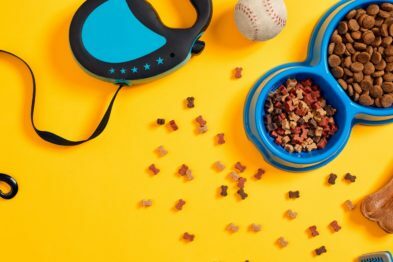 What better way to help your furry friend express that energy than with a brand new toy? Puppies are especially in need of toys that challenge them physically and mentally. Kong toys, tug-of-war ropes, and puzzle games can definitely keep your puppy’s mind and physical health active. You can also let your furball pick out their own toys. Just take them to the toy section of your local pet store and let them pull off the chew toys and bones that they like. Along with exciting toys and games, try taking your fur-baby out for more walks! Walks are an essential part of a puppy’s life and long-term physical health. It helps keep their senses stimulated, improves the human-animal bond, and even keeps them from bad behaviors. It gives your puppy a chance to explore and understand their surroundings. You can invest in a dog harness and any other accessories to make walks more comfortable for your furry friend. There are a number of benefits to a new bed for your puppy, especially if they’re growing a little too big. A larger and comfy bed can help relieve stress on your puppy’s joints, improve their breathing patterns, and help them sleep better. If your puppy has had the same bed for too long, it may start to smell like a pile of dirty socks. By buying a new bed for your pup, it makes it a lot easier for them to sleep and smell fresh at the same time. If you have friends with puppies, consider planning out a holiday-themed puppy party. 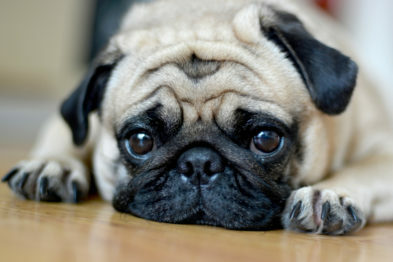 Your fur ball will enjoy interacting and playing with other pups, and you can equally have fun with your own friends. If your home isn’t large enough for a big group of friends and their pups, a local dog park is an easy alternative option. Whether it’s a comfy new bed, toy, or Christmas treat, your puppy will appreciate all that you do for them. By including them in your holiday celebrations, your bond with your fur-baby will surely strengthen, but most of all, your undivided attention will be their most favorite gift of all. 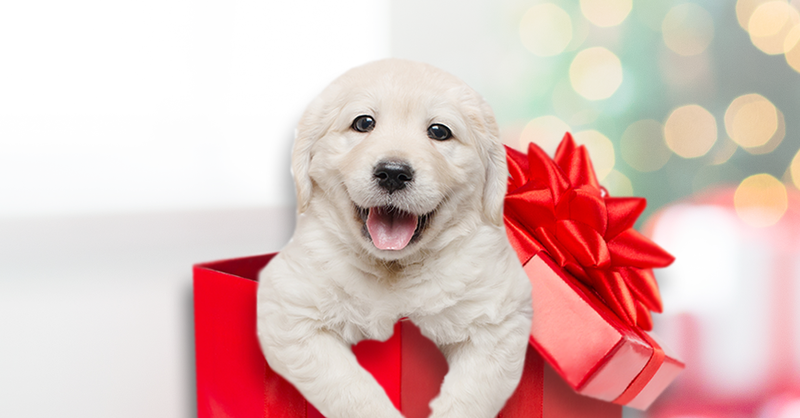 Want to learn how to make your puppy’s holiday experience a positive experience? Check out our other blog: Everything You Need to Know for Your Puppy’s First Halloween. © 2019 Puppy Buddy, Inc.
At Puppy Buddy, we are passionate and committed dog lovers (and puppy enthusiasts!). Our #1 priority is that our puppies come from a loving and caring environment. We hold our breeders to the highest standards, making sure to connect and work with those that are the top 1% USDA Licensed and Inspected. 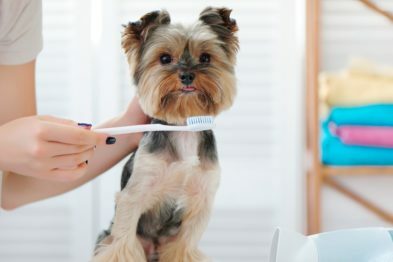 As equally devoted dog lovers, our breeders make every effort to provide all puppies and their parents with utmost love, respect, and attention. Along with standard vet care, all puppies and parents receive plenty of exercise, nourishment, companionship, affection, and socialization. 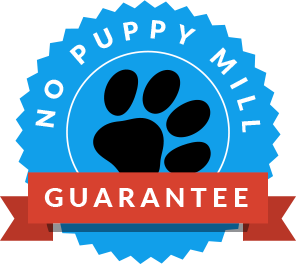 We have a zero tolerance policy for puppy mills. We want all of our puppies to be healthy and happy so that they can find the perfect homes and families.